"Twelve Days of Fun Ending Labor Day" Every year, the state fair is the unofficial end of summer vacation in Minnesota. What to do at the fair is the topic of many conversations across the state, including the list below. 1. Eat food. Choose from pronto pups, deep fried cheese curds, roasted corn on the cob, Sweet Martha's chocolate chip cookies, ice cream from the dairy building, mini donuts, just about anything on a stick, and meals from different dining halls. *tip-share food whenever possible so you can taste more of these treats. 2. Visit the barns and see the horses, cows, sheep, pigs, and other farm animals. You can also visit the Miracle of Birth center to see animals giving birth. *tip-visit the barns early in the day when they smell the freshest. 3. The Coliseum has horse shows, bull riding and a rodeo. 4. Watch Police K-9 unit demonstrations and pet surgeries at the Pet Center. Purebred dogs are also showcased; you can see them up close and ask the owners questions about the different breeds. 5. Walk through the DNR (department of natural resources) building and visit the fish pond to see what fish can be found in Minnesota lakes. 6. Learn something new in the Agriculture/Horticulture, Education, and Progress Center buildings. 7. Appreciate arts and crafts in the Fine Arts and Creative Activities Buildings. I like to see the amazing quilts that people make. 8. 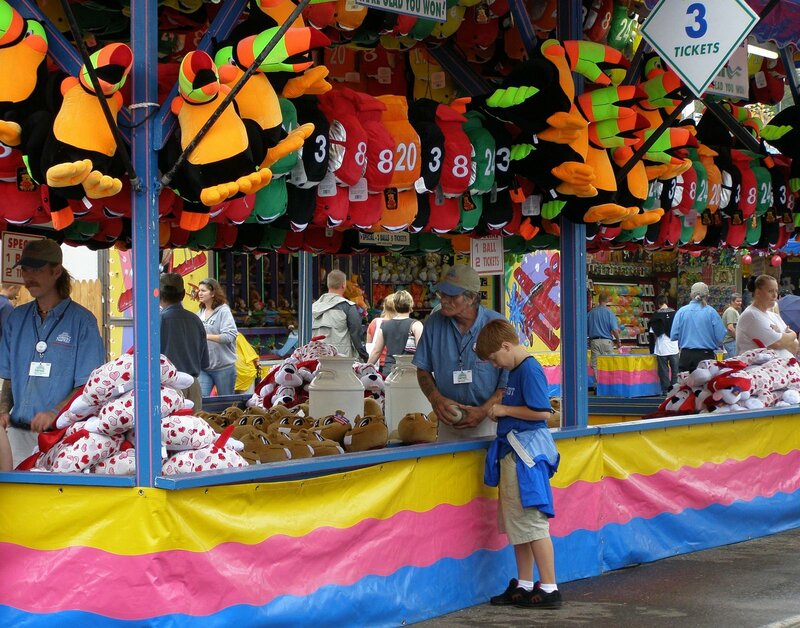 Go on carnival rides and try your skill at carnival games on the Mighty Midway. *tip-buy discount tickets at local Cub grocery stores before the fair starts. 9. Enjoy the talent shows and free concerts scattered throughout the fairgrounds. 10. Attend a concert in the bandstand. These are just a few of the things you can do at the Great Minnesota Get-Together. If you have any other suggestions, please add them in the comments. For more information and other activities, visit the Minnesota State Fair website.